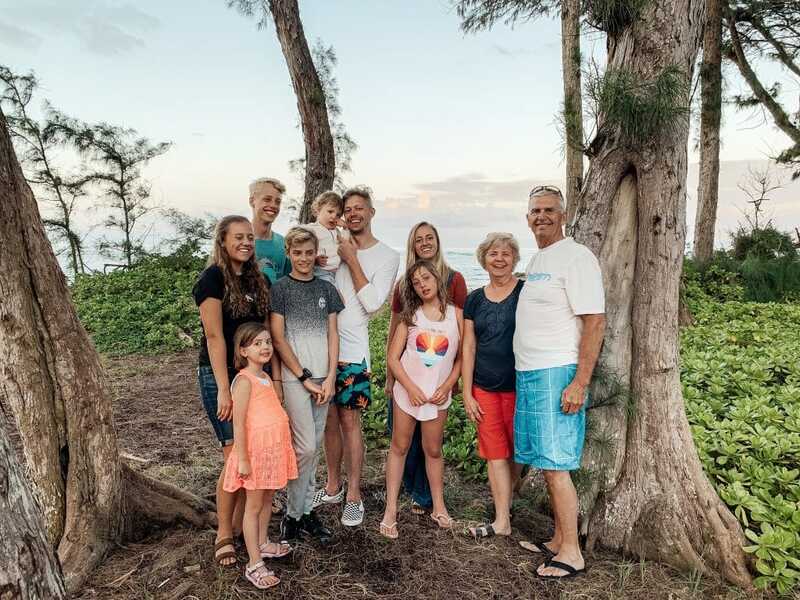 Earlier this week, we returned home from a family trip to Oahu, Hawaii! Last November, we bought tickets to go see Chris’s parents (who are currently serving a mission for our church there) and his brother and his family, who live there full time. (He is a Director and BYU Hawaii). 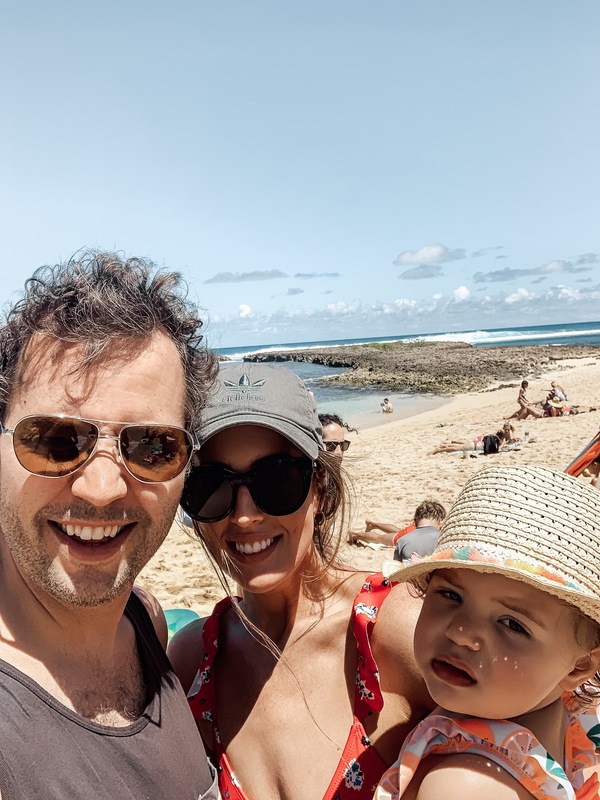 A few years ago, Chris and I explored Maui on a baby moon, but it was so fun to have our girls with us on this trip–and exhausting–and check out a new island. 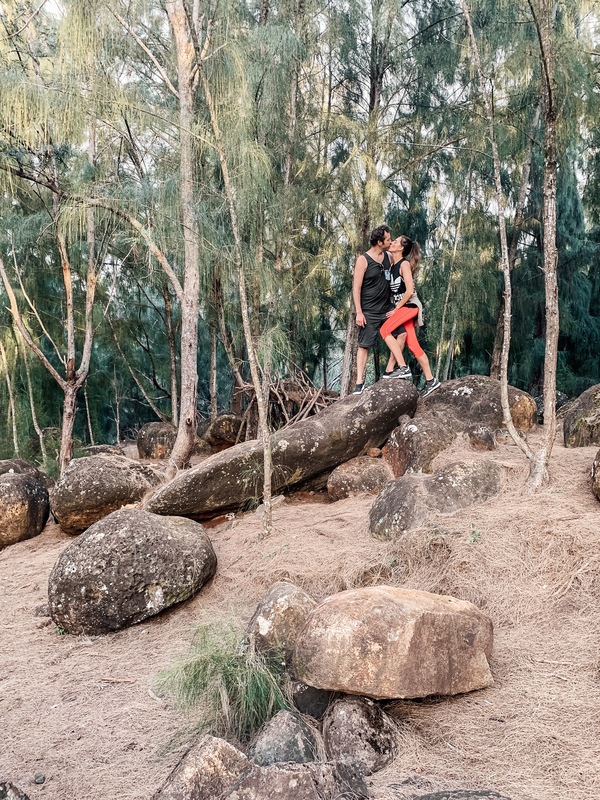 We stayed mostly on the North Shore and it was a wildly different experience. To see an overview, check out this month’s monthly video below or here on our YouTube channel! (most of the footage is from my phone, but Jordan captured the really good shots–he came too at the last minute to spend time with his grandparents (Chris’s parents) and cousins who live there). If you want more details on our trip, here’s where and what we did! 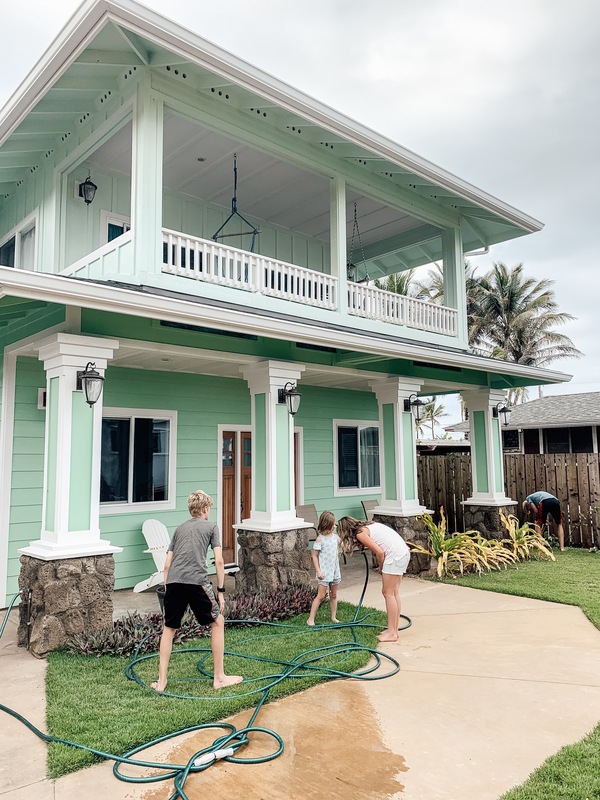 We stayed at Turtle Bay. It seems like this is pretty much the standard place to stay on the North Shore. 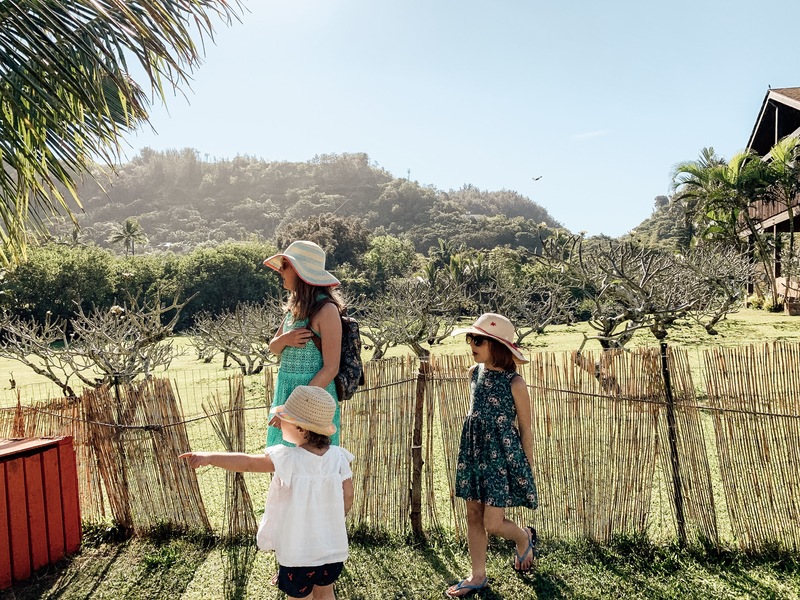 For sleeping arrangements and nap time, having three separate rooms is ideal for our family and we were able to get the best price by Airbnbing a three bedroom condo at Turtle Bay. It was nice enough (nothing fancy) and worked fine for our family. 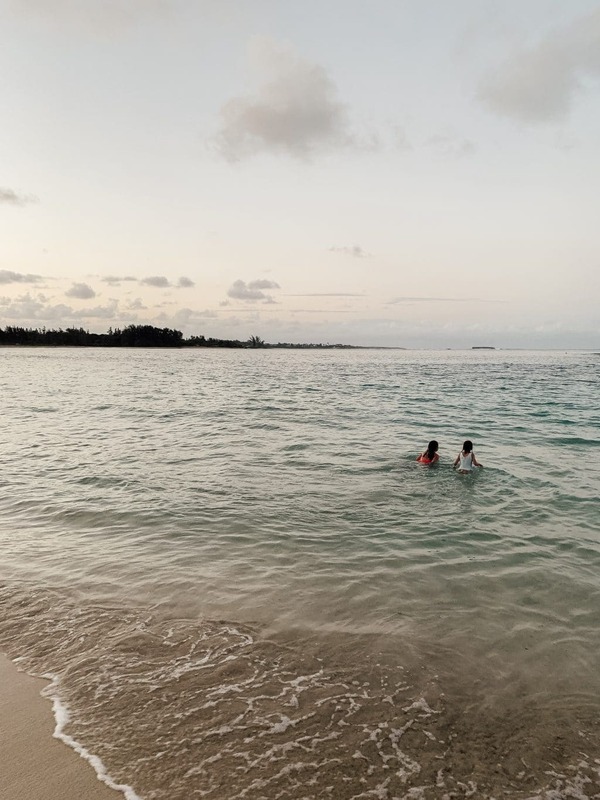 Plus, the beach at the resort is perfect for kids–in fact, our girls deemed it their favorite of all the beaches we went to, and we went to a lot! That is, everyone but Polly, who couldn’t stand the sand or water and wouldn’t let me go—I didn’t mind. 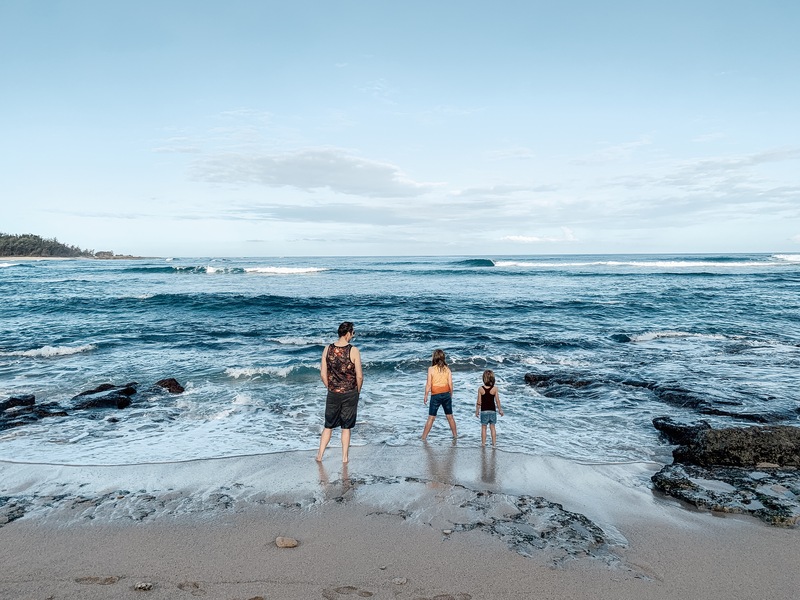 Note: There are two beaches at Turtle bay, the one on the right of the resort is calm and great for snorkeling and kids and the one on the left (below) is rocky and rough–but beautiful. 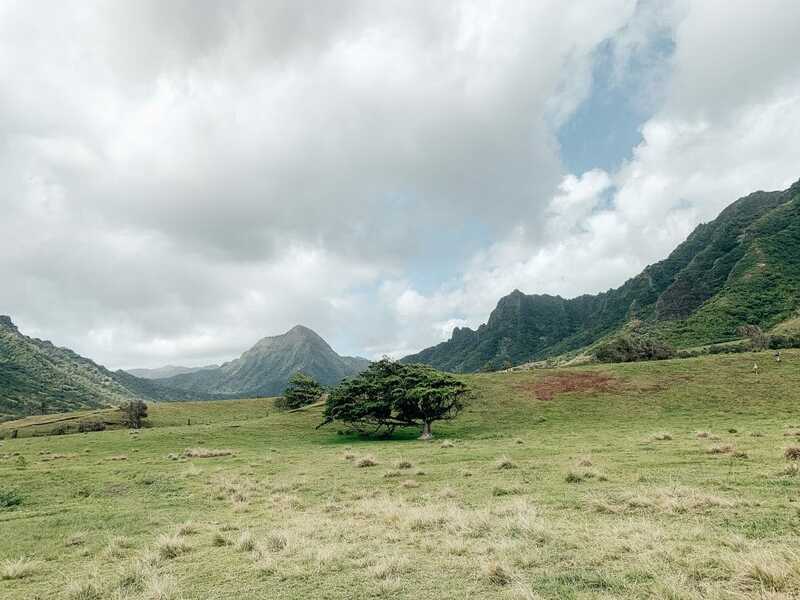 If you follow the shore of the one on the left, you’ll eventually reach a cove and trees where the second Hunger Games was filmed! 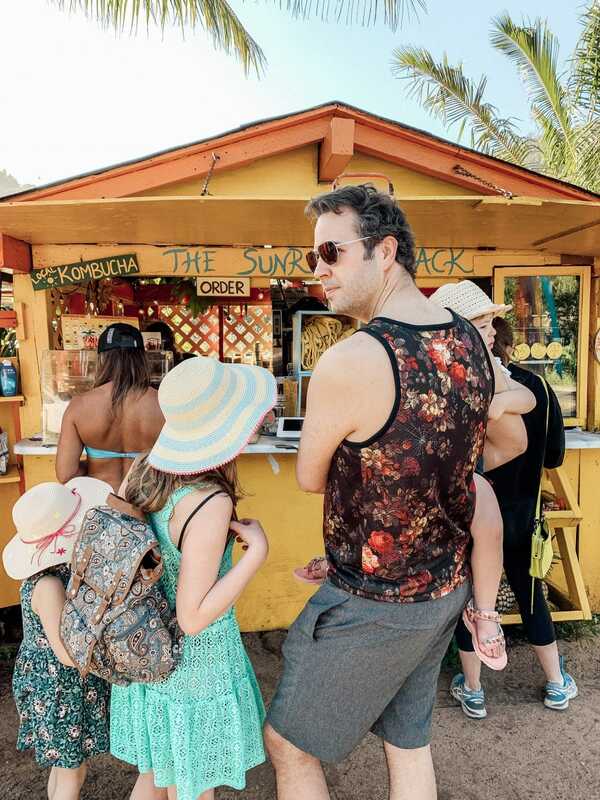 Our first morning, we stumbled upon The Sunrise Shack and they had the most amazing Acai Bowls, I’m drooling just thinking about them. 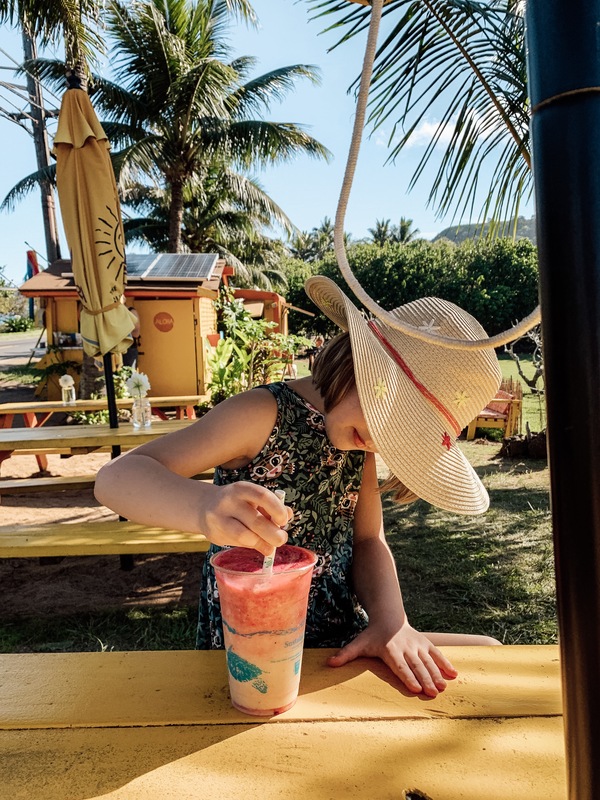 Our girls got smoothies that they all devoured–Polly included. There’s a bunch of picnic tables to the side and umbrellas and it’s a beautiful spot to get a fresh breakfast or snack. Afterward, we settled in at Sunset Beach a mile down the road for a few hours. There wasn’t many people there and the tide was a little strong for the girls to swim, but they enjoyed running in and out with the waves and watching the incredible surfers do their thing. Polly clung to me and tried to be a good sport. Later, we got lunch from Aji Limo–it’s across the street from Shark’s Cove, another great spot for snorkeling!–and it was one of my favorite things I ate while there. 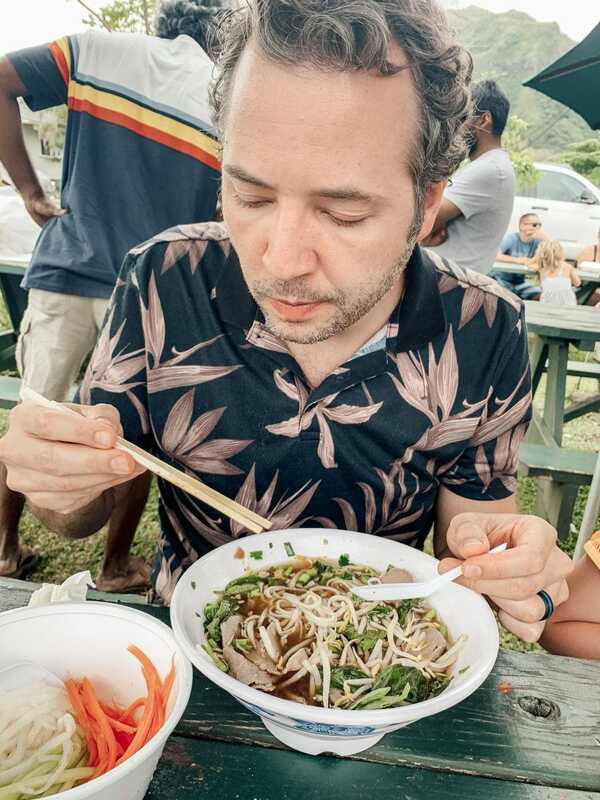 Because of my food restrictions, I often get asked how I eat while I travel–and I eat the same–with the exception of grain–I did have some rice and corn chips on this trip. 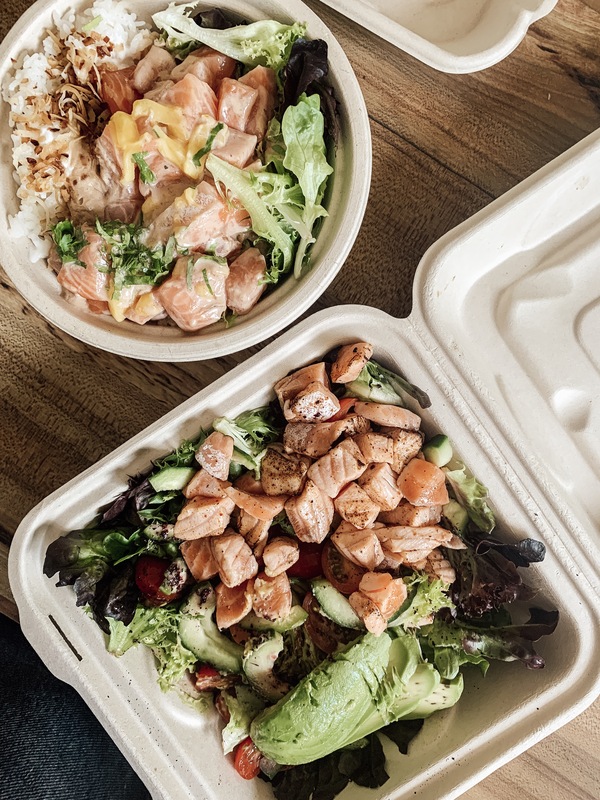 Chris got a poke bowl and I got a smoked salmon salad and both were incredible. This is Chris’s brother’s home (isn’t it darling!?) that we spent a lot of time at too. Playing with cousins, chatting, eating, playing games and having a couple built-in babysitters on this trip was a perk! One evening, Chris and I escaped with Jordan and his friend he invited on the trip for a sunset hike. The Ehukai Pillbox Hike on Oahu’s North Shore took about 35-45 minutes to get to the top and it was stunning. It starts off flat but the trail got progressively steep–okay, we were panting. 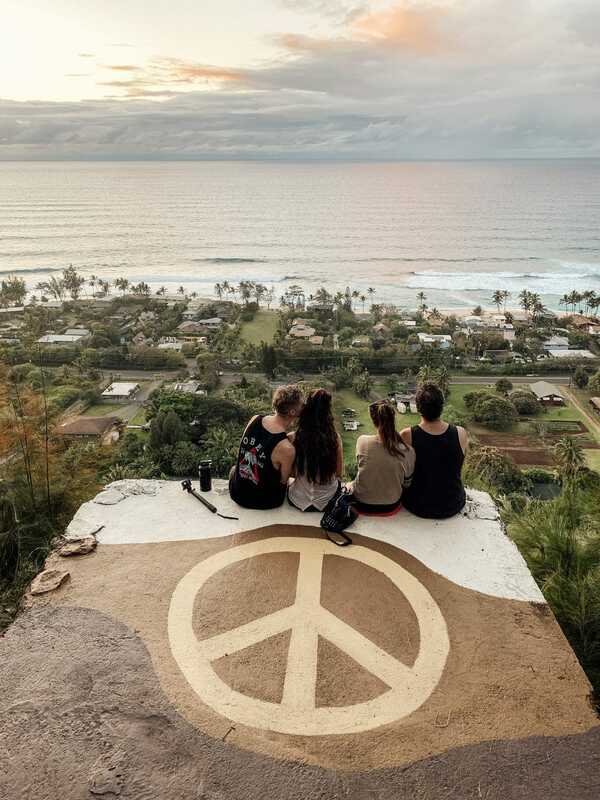 We got to the 1st pillbox and took in the views for a few minutes (and caught our breath) and then continued on the trail another 5-10 minutes and reached a 2nd pillbox just as the sun was setting and the view was unbelievable. It has unobstructed views of Sunset Beach and the North Shore coastline. 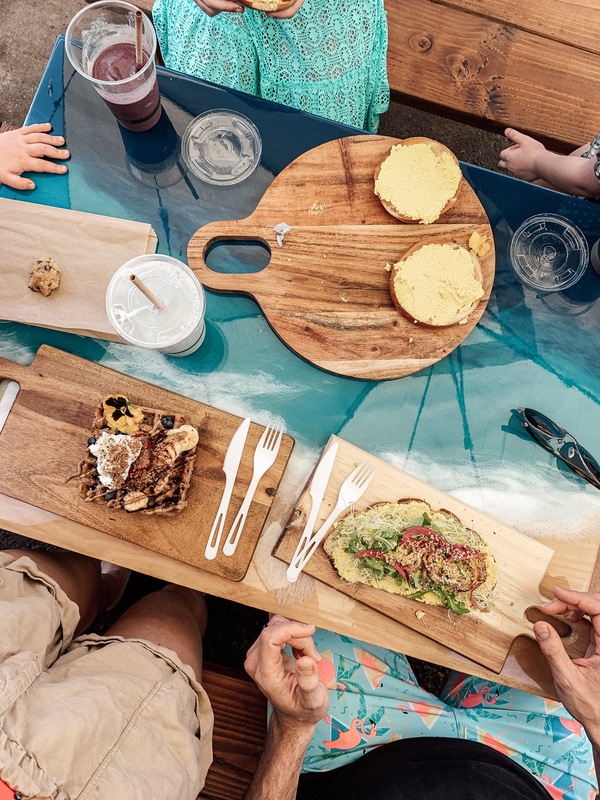 The following morning, we hit up Raised By The Waves for breakfast. It’s vegan, gluten free, and very health conscious and delicious. You can’t go wrong with the waffle (yum!) or any of the toasts. 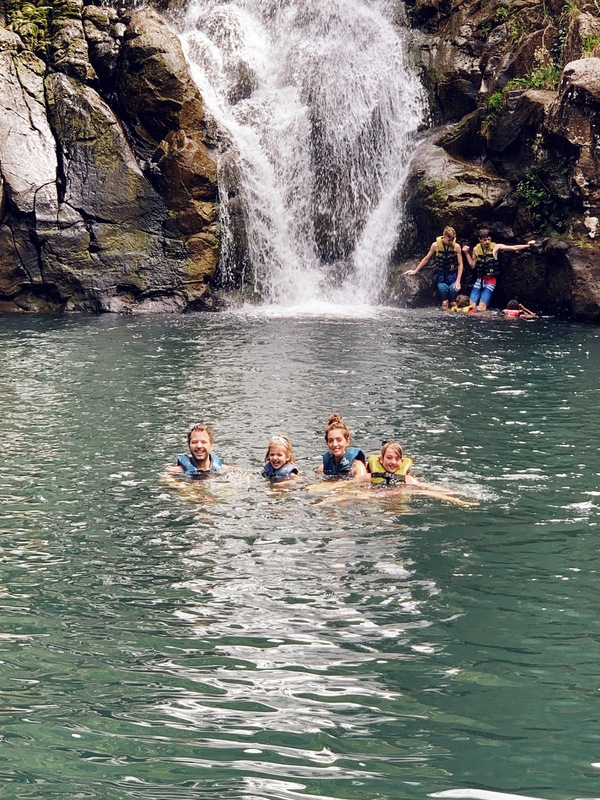 Our girls were begging to do a hike of their own so we “hiked” to the Waimea Waterfall. It’s actually a paved path the entire way, but you can take stairs to alternate paths in the trees and closer to the water. There are some hills and lots of cool plants along the way and the girls loved it. Note: There is a fee to enjoy this hike, but we all found it was worth it. The trail leads to a waterfall where you can swim. It’s FREEZING, but we all got in anyway. There are life jackets available to everyone who wants to swim. One morning, my in-laws treated us all to a tour at Kualoa Ranch. 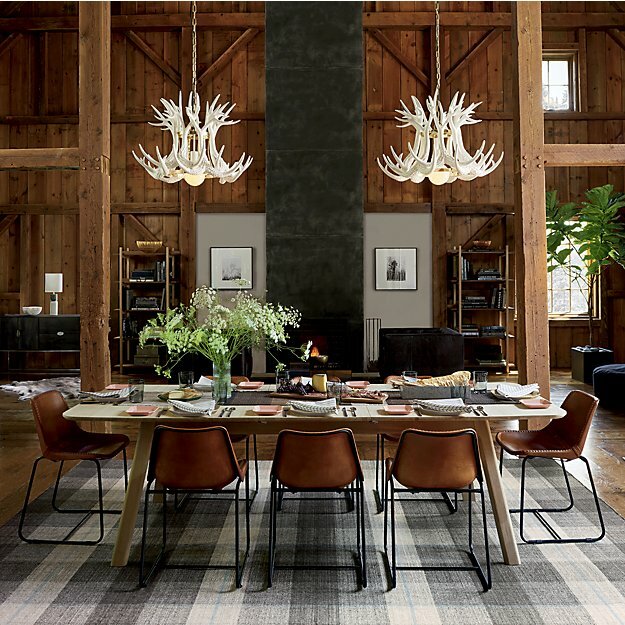 It’s a breath-taking 4000 acre ranch where everywhere you look is picturesque. 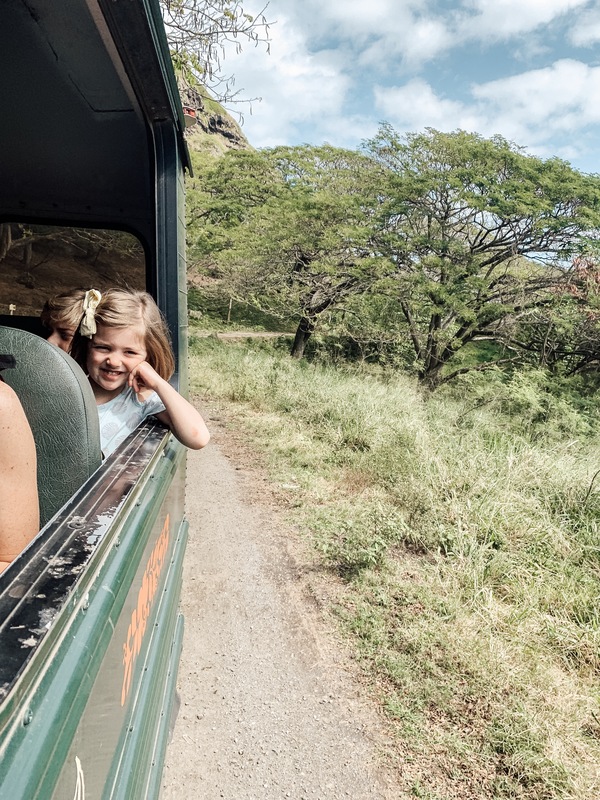 It was fun to take a vintage school bus around the ranch and have our tour guide tell us a bunch of interesting facts about how it came to be, see WWII artifacts and exhibits and see all the many many scenes to SO many movies and TV shows that were filmed there. 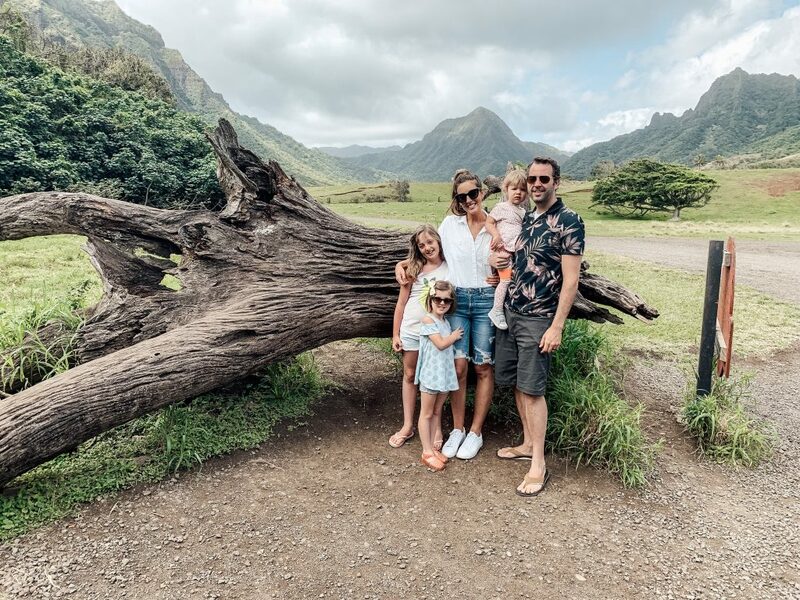 We took a photo next to the Jurassic Park fallen tree (our guide had the dinosaur in his pocket! 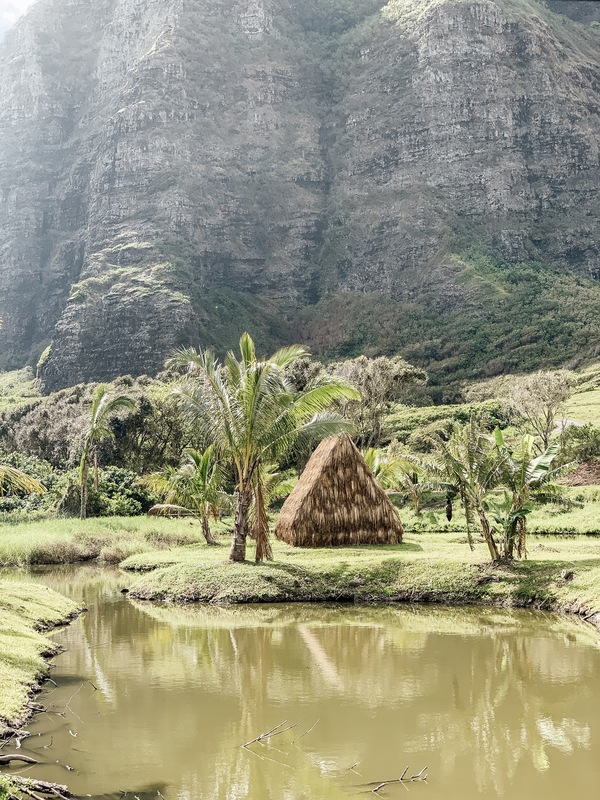 ), Godzilla’s footprints still exist there, the famous “penguin” road site from 50 First Dates, LOST areas, like Hurley’s golf course! 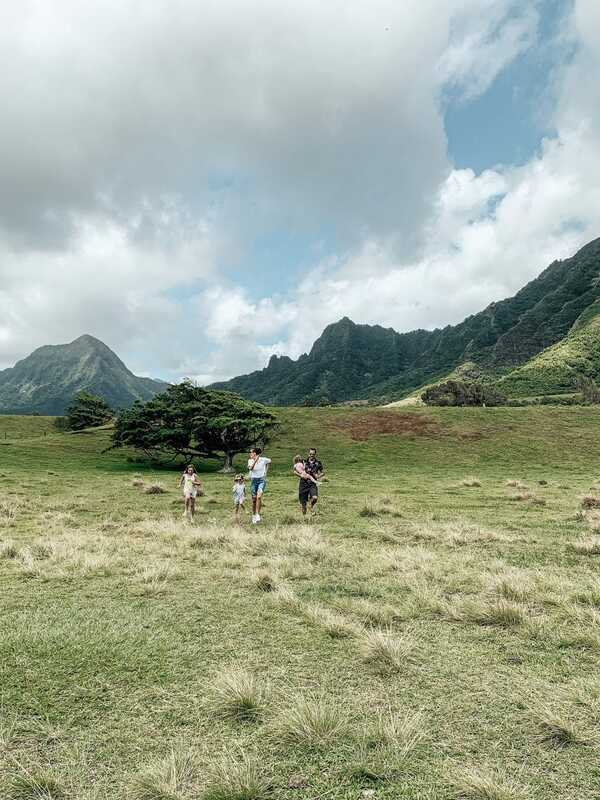 We re-enacted the scene for Jurassic World where they are all running down the hill and Chris reminded me it was the same hill that Jumanji was filmed on. Less than a minute away, across the street, is Chinamans Hat Island. 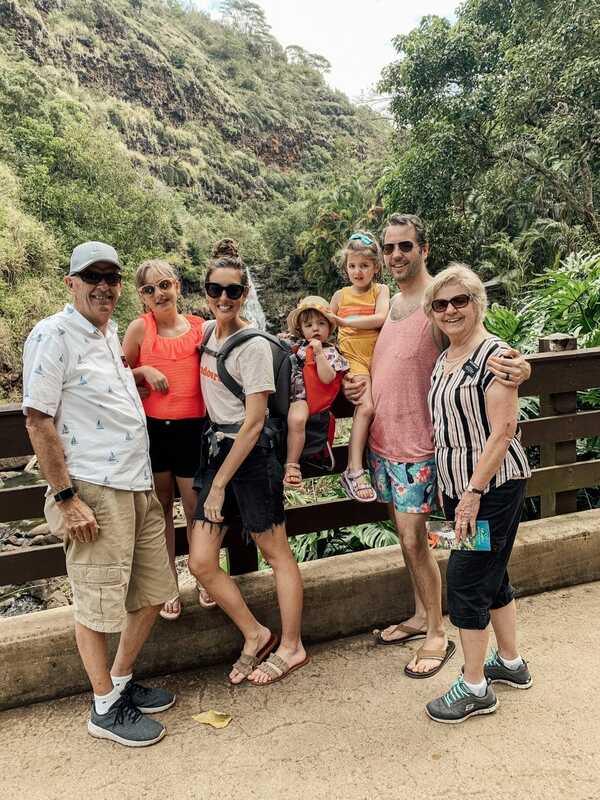 You can hike to the top, but Chris, Greta and a few family members walked across the ocean to it (Greta had an inner tube but Chris could touch the entire way! A few cousins had paddle boards) and hiked around to the back where there are some fun waves to bob up and down in. I stayed at the beach with Faye and Polly. The water was shallow for quite a ways so it was fun for Faye to play in while I stayed on the shore with Polly–who still (clearly) hated everything about the beach. Afterward, down the street there’s a Thai food truck court where Chris hit up a Pho truck and I and the girls a neighboring Thai truck and the food was out of this world. (The red curry–wow!) We are still talking about our food there. We didn’t have time to dedicate a whole day to the Polynesian Cultural Center, but one evening, the whole family went out to eat at Pounders for dinner–my niece is a server there!–and the food was really great (she recommends the pizza) and then took the older girls to the night show at the PCC. It was entertaining and educational and inspiring. Highly Recommend! 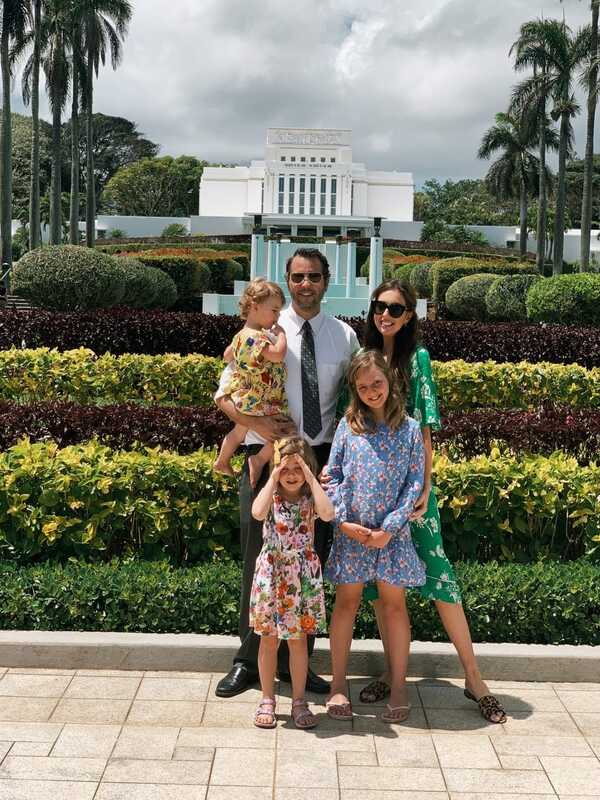 On Sunday, we went to church and then explored the Laie Temple grounds and Visitor’s center–everyone is welcome there and the grounds were so beautifully kept. On our last day, we ventured down to Hanauma Bay, which was about an hour and 20 minute drive for us on the North Shore. We heard so many amazing things about snorkeling there, we thought it’d be worth the drive. The beach itself is gorgeous, and the girls saw a lot of fish, some very big! Jordan saw a turtle! But overall, we all walked away feeling like it probably wasn’t worth it. It was very crowded, the parking lot was full so we had to park a mile or so down the road (near Walgreens) and take a shuttle and then pay to get in and then watch a 9 minute video on conservation of the beach and then carry all of our beach gear, including babies–haha–up and down a pretty steep hill. I’m glad we experienced it, but if you’re on the fence about going–I’d skip it if crowds aren’t your thing. It was the only beach we had to pay to access and it was our least favorite and most crowded. We made up for it by getting shaved ice afterward at Kokonuts and all the girls fell asleep on the way back to the North Shore. Our last night, we all gathered for one last hurrah at Kokololio beach park. We cooked hot dogs over a fire and chatted away. It has a large grassy field with lots of trees so Polly happily ran around and I forced all the cousins to smile for a photo before the sun went down. And as it did, Greta and Faye took one last dip in the ocean before we caught our plane the next morning. (Note: this beach has the softest sand–we LOVED this beach). It was also this night, while taking this photo that I knew if we ever had the opportunity to do a beach house–this would be the palette. Not the beach at noon or sunrise. But this. I was so inspired by the hues at sunset, the deeper, grayed out greens and blue-ish gray tones with brown and tan and a hint of black and white. This is my kind of beach house! 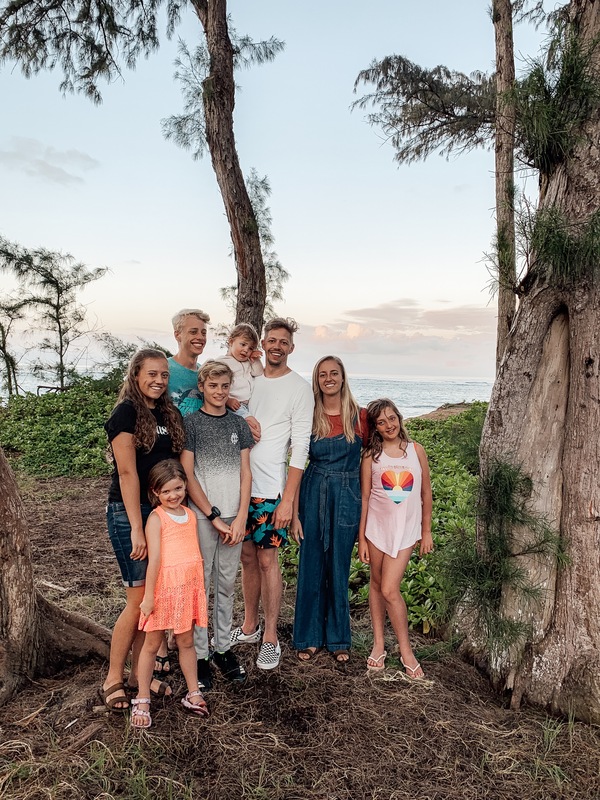 We’re so happy to be back in Idaho, and still trying to adjust to the time still, but so extremely grateful for the opportunity and experiences and memories we had in Hawaii. 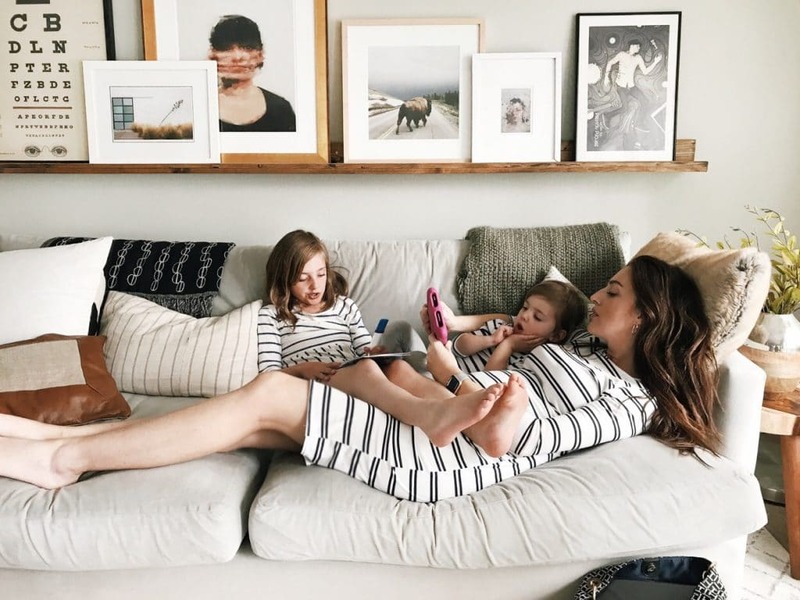 « My Favorite Source for Turkish Towels + 30% off code! I have three kids, all about the same ages as yours, and the thought of taking them on a plane ride that long gives me anxiety! 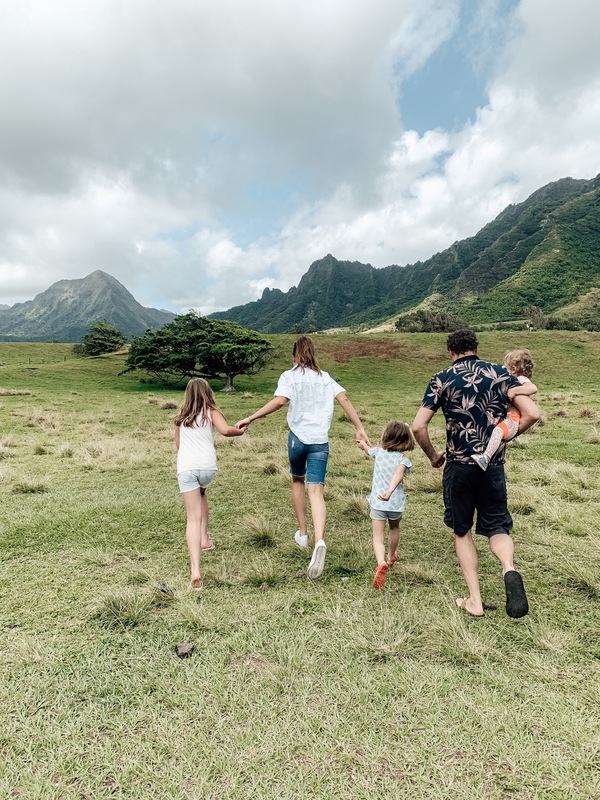 I would love to do a family trip to Hawaii when they are older though. Would you mind mentioning where you got those cute distressed denim Bermuda shorts in your first pic? 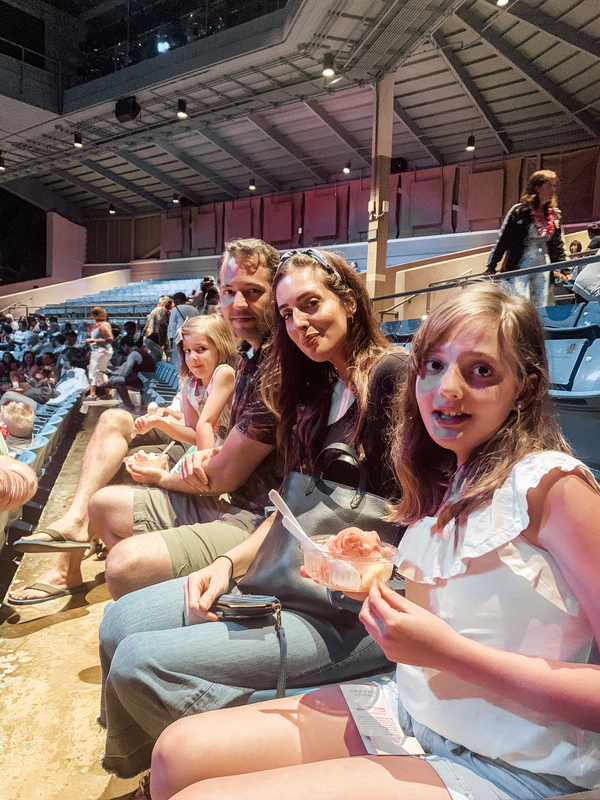 The older two (9 and 5) did amazing and besides the 5 year old having to go to the bathroom every 40 minutes (what’s new) they were so happy to have A LOT of screen time–which is really rare. Polly, the baby, did perfect the way there and slept for a good chunk and then was also enamored with her favorite show. The way back had some challenges–she was overtired but finally took a nap and was all good. Getting her her own seat and strapping her in a carseat was 100% worth it. Thanks so much for sharing your beautiful trip! It brought back a lot of happy memories from my trip there as a teen. I look forward to taking my kids there one day! Wow! 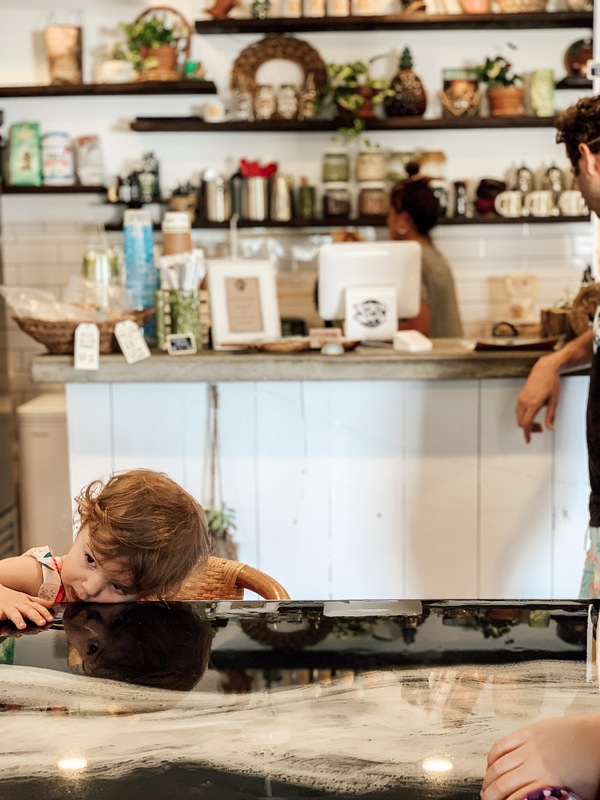 What a fun experience!….Loved the photos and the info. Looks like a trip of a lifetime. 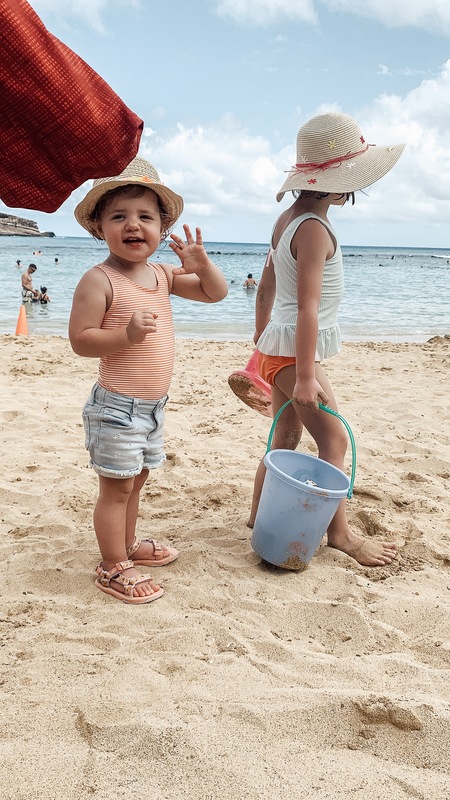 Don’t worry about Polly hating all beach related things…my granddaughter was exactly like that when she was little…but now as an adult she loves the beach, just like the rest of us do. Thanks for sharing! Hawaii is so incredibly beautiful. I can’t wait to take my girls there. I loved that you just mentioned that Polly isn’t a very cuddly child but it seems on this trip that sand had her in her mama’s arms! Haha, I love it. 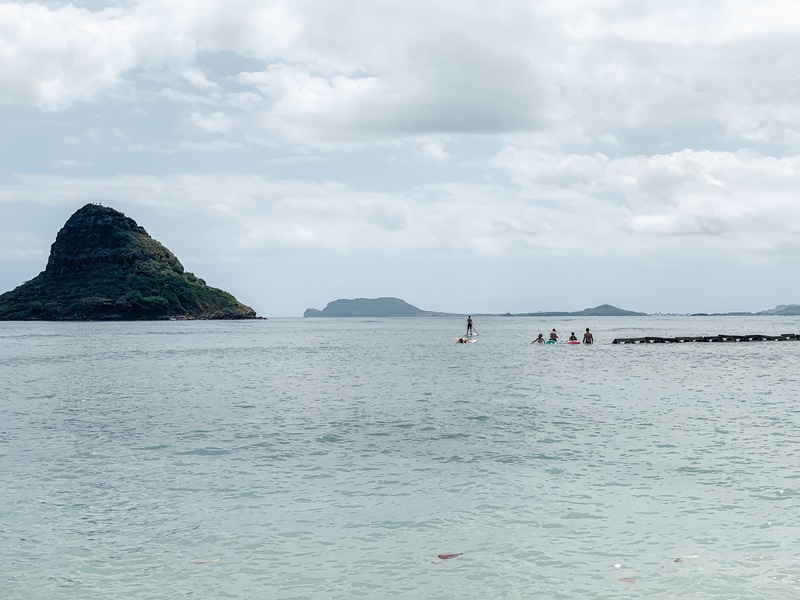 We got to Hanuma Bay early in the morning, and had a completely different experience! If you get there before 7 AM, you don’t have to pay to park, or enter. A park guide talked you through the conservation needs. There are way fewer people and the sunrise was incredible! I recommend this route for folks if possible. All your photos and videos are just magic! Just our of curiosity, do you have a professional photographer that follows you everywhere, or is it all you? Would love to see a post on how to the take such gorgeous pictures! I literally took every one with my phone!! Beautiful pictures. 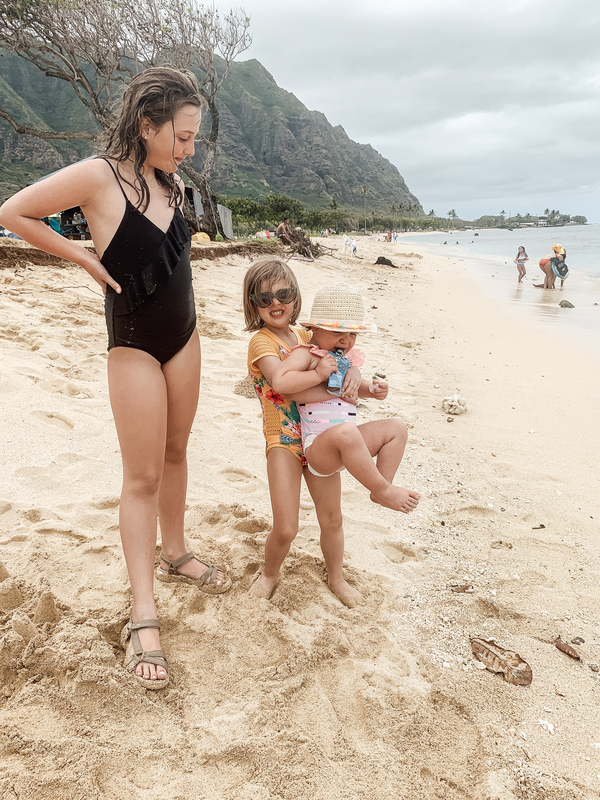 I’d love to get my three little ones to Hawaii soon. How did Polly do with the time change? I had the same reaction to Hanauma Bay, not worth it. Overcrowded beach and so much sand kicked up by the volume of snorkelers that it was hard to see the fish. 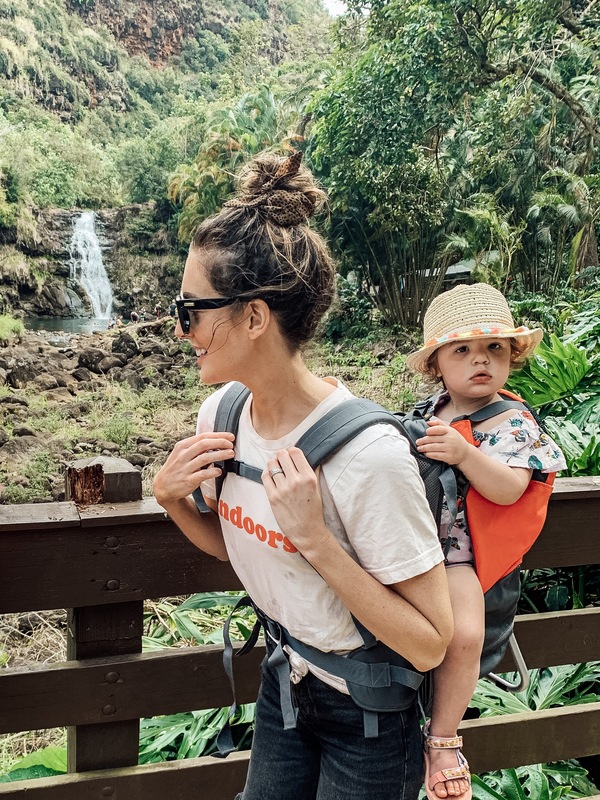 I stayed closer to Honolulu and some of my trip highlights were the botanical gardens and a different waterfall hike. Hawaii nature is so beautiful! Looks like it was a great trip. I loved hearing and seeing a little about your faith sprinkled in this post! So fun! 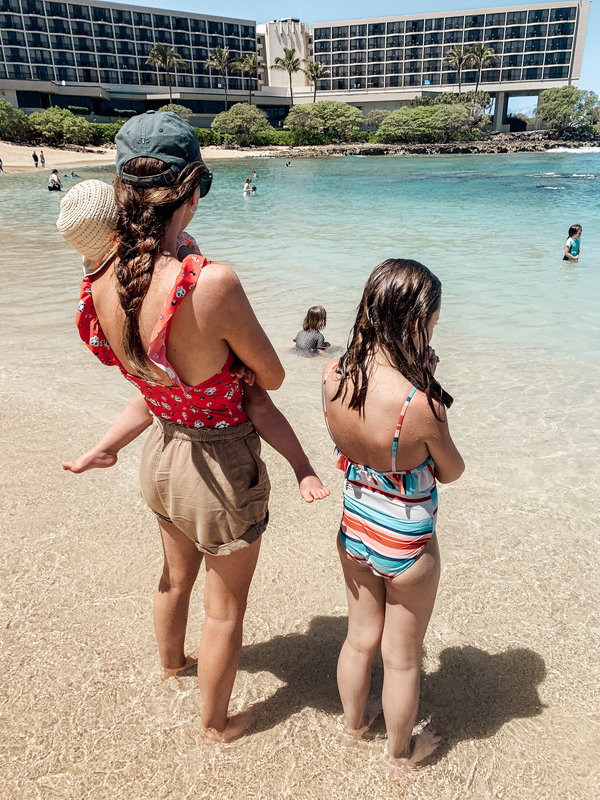 We got home from a trip to the north shore of Oahu the day before you left. It’s fun to see the difference between our trips–there were SO many things to do and see. The craziest thing is the difference of the waves at the beaches–I think we went to some of the same ones . The days we were there they had 40 ft waves and it was too dangerous to be in the water. The water looks much calmer in your pictures. Also, can I ask where Chris’ parents are serving? My parents went with us and we were talking about how fun it would be to serve a mission there. 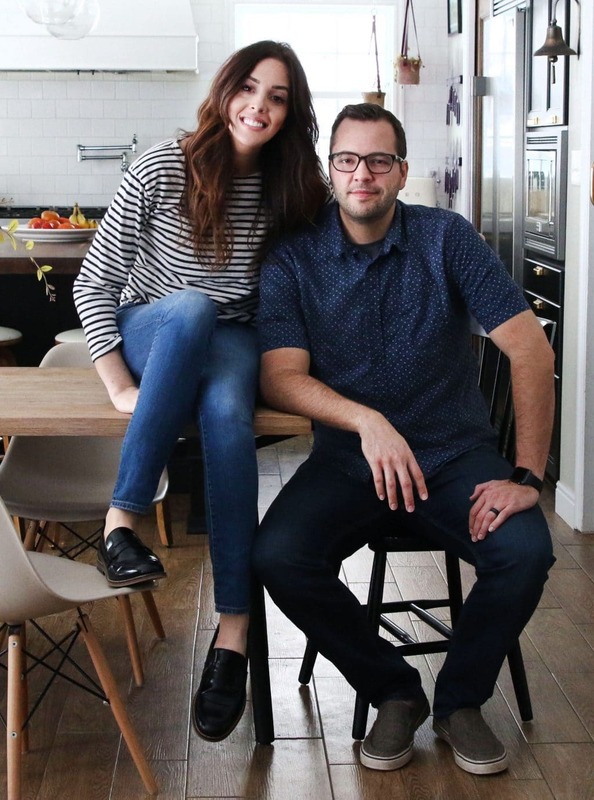 They were called to serve on BYU Hawaii campus. He’s a retired religion professor and he has been teaching there! She is working in the admission office. They love it. You have beautiful girls. And wow Greta is so tall!! I have many happy memories of past trips to Hawaii. I’d love to see the movie ranch. 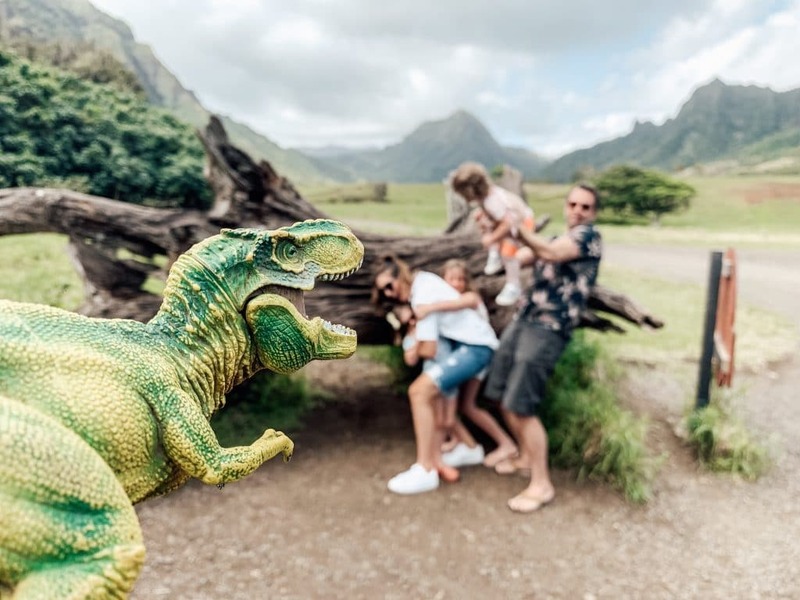 And that “Jurassic Park” photo looks ripe for some of your sister’s photo magic (take two photos and merge to get both foreground and background in focus).